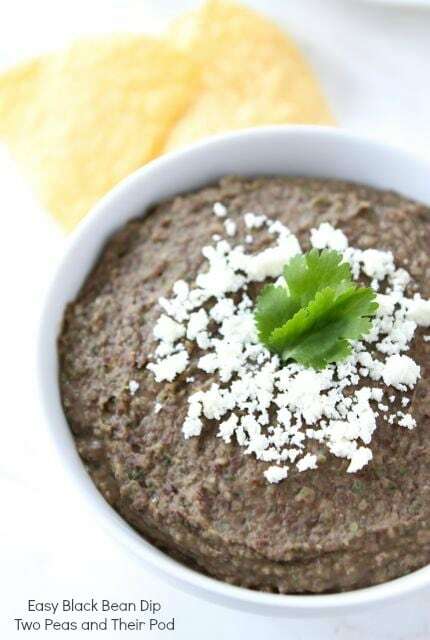 Easy Black Bean Dip – anyone can throw this bean dip recipe together – put black beans, onion, cilantro, garlic, jalapeño, lime juice, and spices in a food processor or blender and… boom! You have a tasty bean dip full of flavor and good for you too! If you are still finalizing your Super Bowl party menu, make sure you add this Easy Black Bean Dip.This bean dip recipe takes 5 minutes to make. I am not joking. I bet you could even make this bean dip blindfolded. It’s that easy! 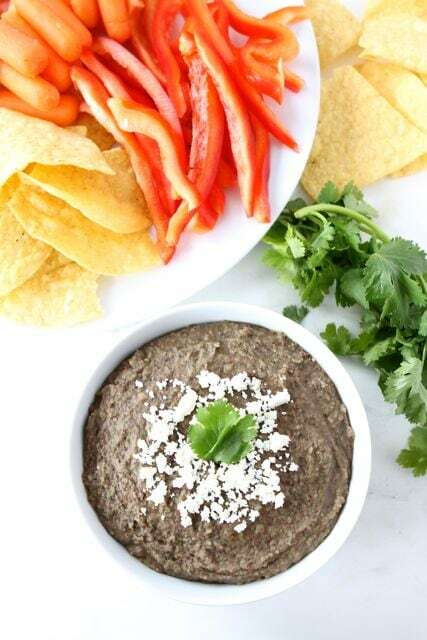 Simply serve this Black Bean Dip with tortilla chips, cut up veggies, and crackers. 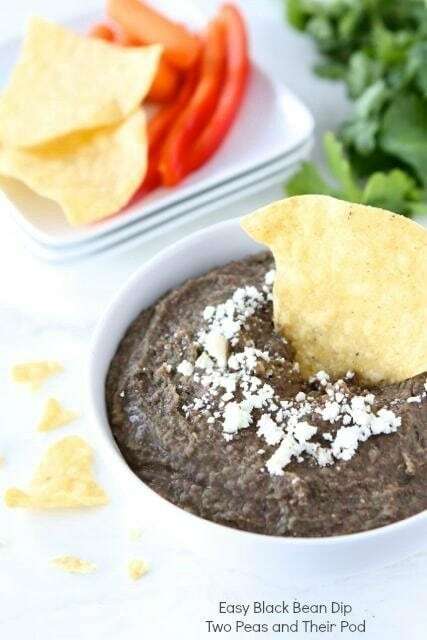 Not only is this bean dip recipe great for parties and snacking at home, but we also like to use this Easy Black Bean Dip as a filling for quesadillas! 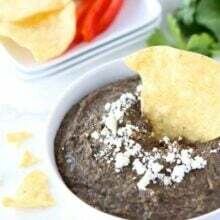 To make the bean dip, all you have to do is put black beans, onion, cilantro, garlic, jalapeño, lime juice, and some spices in a food processor or blender and blend until smooth. Boom! You have a tasty party dip that is full of flavor and good for you too! We like to sprinkle cotija cheese on top of the bean dip before serving. It spruces up the dip a bit. I will admit this bean dip recipe doesn’t make the prettiest black bean dip, but who cares. Looks aren’t everything! This black bean dip recipe is even Caleb approved. He always ends up with a cute bean face:) Get your game face on and make Easy Black Bean Dip for Super Bowl Sunday! This dip can be made in 5 minutes! Serve with tortilla chips, veggies, or crackers for an easy appetizer or healthy snack. 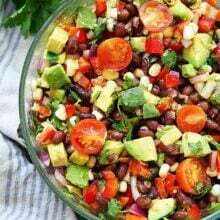 Put the black beans, onion, cilantro, garlic, jalapeño, lime juice, cumin, chili powder, salt, and black pepper in a food processor or blender. Blend until smooth. Pour the black bean dip in a bowl and garnish with cotija cheese, if using. 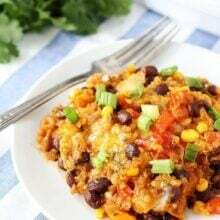 Serve with tortilla chips and/or cut up vegetables. Note-omit the cheese garnish for a vegan dip. This dip is gluten free, just serve with gluten free chips/crackers. I’m still figuring out what I”m making! This dip sounds simple and healthy! Gotta love that! I can become very addicted to black bean dip! I love it and your’s looks delish!! I love black beans and this dip looks and sounds fabulous! I think it’ll be on our menu as well. Plus, it’s nice to have something healthy to eat at a Super Bowl party. Within the past week I have made your Tortellini Soup, Roasted Mushroom, Spinach, and Goat Cheese pasta, and Salted Caramel Chocolate Chip Cookies. My husband is in heaven, and I love the simplicity of all of your recipes. This bean dip will be making an appearance on Sunday! Hand me the tortilla chips, I need this now! Ohhhh< i want to come to YOUR super Bowl Party! All sounds delish Maria!!! This is the perfect dip for Superbowl Parties- my husband would love this! Nice and quick and easy to make and yet so good! Sounds good. I am globbing it onto your Cilantro Lime Rice, for sure! So good! Love that this is vegan, Maria. Well, I can tell you right now, that bowl would last 5 minutes in my house! crazy easy and crazy good! yes please. Love it, easy and delicious! This will be part of my super bowl spread! i love how easy this is to come together. when you’re having big party/get together, the last thing you want is a super complicated dip! i love this!! Sounds so easy and delicious! Bean dip and chips should stay very far away from me because I have zero self control! This recipe = yum!! This would definitely be a hit at any Super Bowl party…or just at afternoon snack time. Looks great, Maria! Do you find that you need to reserve any of the black bean liquid to get the consistency right? Looks like the perfect dip for the big game! Love all the flavors! I LOOOOOVE black beans. This is perfect!! Sometimes pretty can be so over-rated. I want this dip! Tasty and good for you! Perfect dip! I love anything with the word “easy” in it! Looks delicious! This is stinking fabulous. Why is my face not in it? 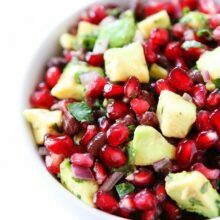 I’m going vegan for the month of February and this dip will be perfect for eating during the super bowl, great timing! Wow! This sounds so flavorful! Too funny that I made black bean dip today. Posting tomorrow. 🙂 I’ll have to try your version next! Ohhh this does looks tasty and I love the healthy dip for such a typically unhealthy event. Perfecto! I love me a good bean dip and black beans are some of my faves! Thanks for sharing! Happy Super Bowl!! I’m always up for trying the newest dip on the block! Not gonna lie, the cotija won me over. Love that stuff. Black beans are my favorite! Loving this recipe! LOVE easy dips like this one! I’m dreaming of black bean dip right now! My tummy is grumbling!!! Yum! This made A LOT of dip – can I freeze some of it and use it a week or so later? Will it still be tasty when thawed? Please let me know what you think. Thanks. This is DELICIOUS! Made yesterday and hubbie and I polished off the whole thing w Tostito’s multi-grain scoop chips. YUM! Must try this! Hard to believe i’ve never made black bean dip. Found this page earlier today and made it soon after. SO good! I knew my 2 year old daughter would want to try it because she loves all things that have to do with ‘dipping’, so I didn’t use the whole jalepeño or all of the chili powder. Other than that, I followed your exact recipe. She loved it too! Glad you liked the bean dip! Awesome! Just recently became vegan and was looking for some tasty alternatives- came across your bean dip, made it today- I am in love! Absolutely delicious! Thank you! Excellent recipe! Enjoyed it so much and can’t wait to make it again. Thank you!! I roasted the pepper, onion and garlic first to take the edge off and kept some of the black bean juice to thin. Really yummy! Wonderful, clean dish that I can eat! I added this to the top of nachos one night and my entire family loved it and asked for seconds! I had some black beans and cilantro around and have never made black bean dip in my life but was craving it. I picked up the other fresh ingredients and whipped this up ever-so-quickly and was very pleased. Thanks for the great recipe! This isn’t far from my black bean hummus (which is my addiction). Drop the onions, jalapenos, and chili powder, and add tablespoon each of tahini, olive oil, and soy sauce. I’m chilling your bean dip as I type this! I added tomatoes, it was too thick to actually blend together in the food processor, so the added tomatoes added a bit of liquid and allowed it to blend together. I didn’t measure anything exactly though, as that’s my method of cooking. Came out great! I just made this and it is awesome! I am a recipe tweaker and this needed no tweaking- thanks! YUM!! Pingback: Sausage Cheese Dip | Never Enough Thyme — Never Enough Thyme - Recipes with a slight southern accent. Pingback: Black Bean Dip (Dorm Chew!) | Chew can do it! Hi, I just made this, and it’s super tasty. And no oil in there — bonus (there’ll be enough oil in the tortilla chips I’m frying up – ha). Thanks for the recipe; I’m taking the dip to a Christmas eve appetizer party. Happy holidays! Oh, and you noted that you use the dip in quesadillas — do you also put cheese in them, or just the beans, or the beans and other stuff? I want to try making quesadillas without cheese sometime, because I miss them (I don’t eat animal products anymore), so if you have any thoughts re: vegan quesadillas I’d love to hear them! You can use the bean dip and smashed avocado…add green onions, chopped cilantro too! Yep, great idea — thanks! My friend brought this over on my birthday and I LOVED it. Could I get the info on the calorie count if you have it off hand? Thank you for a great recipe! I made this last night after googling “bean dip with canned black beans”, and it was a HUGE hit with my family. We had it as a dip alongside some chicken enchiladas and homemade salsa and chips. I blended everything plus a few teaspoons olive oil with my immersion blender. Then stirred in a little grated jack cheese, and microwaved in a bowl, stirring and microwaving until nice and hot. Topped with a little more cheese to melt on top and it was to die for!!! I don’t think you really NEED to heat it, but we prefer warm beans and the flavors just popped. I used a serrano because we like the heat, you could really taste the onion/garlic and the lime juice. SO so so good, thanks for this one. My 16 year old boy said “why is this the first time we’ve had this? 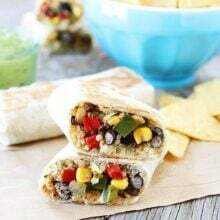 ?” I knew it’d be a hit because its very similar to our blended salsa we make except beans instead of tomatoes and added spices. Just wanted to leave the feedback because my husband is still talking about it this morning and he doesn’t even think he likes beans!! I will be making this again for sure. Yay! I am so glad the dip was a hit with your family! This is now my go to Black Bean Dip recipe. My entire family loves it and it also fantastic on burgers. Glad your family loves the dip! I really enjoyed this recipe for Black Bean Dip, as did my guests. I made this recipe. We LOVED it!! All of the herbs were the perfect combo. I did not have a jalapeno on hand so added chili pepper flakes. The dip was amazing! Will make it again and again. My husband and I loved it! It was so easy to put together! This is our new bean dip! Yay! Glad you both enjoyed it! Great bean dip! I think I put too much onion though, so I added a bit more lime juice.